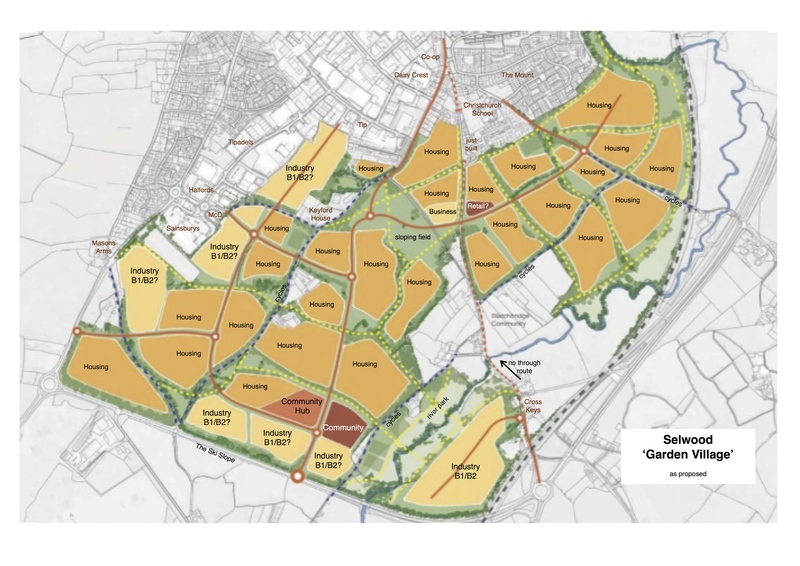 In February 2018 the Selwood Garden Village proposal was made public. It is a response to the Mendip District Council Local Plan Part 2 Consultation. It suggests that the MDC plan should allow for a further 2,200 homes in Frome and these should be sited to the south of the town, below Keyford on the southern slopes of the town. The scheme also includes business allocations & a community hub. It was submitted by the ‘South Frome Consortium’, a group of landowners, (developers?) and consultants. See the submitted documents here. This website aims to explain the proposals for the general public and has been created for the Frome & District Civic Society by Katy Duke. The Civic Society’s opinion on the proposal will be given once the documents have been thoroughly examined. Please note that these documents stretch to 388 pages of information. As the masterplan is difficult to read at such a small scale, Katy has mapped it onto googlemaps to make the proposal easier to understand for the general public (and also added the key to the diagram below). Links on the right explore what a ‘Garden Village’ is, and give good background. See the housing section for current housing number requirements. The phasing proposed is explored here. Find also exploration of highways issues, paths and green space. The Selwood Garden Village project Create a free website or blog at WordPress.com.